Black graphics on a silver background, pointer has black hub with fade resistant acrylic orange staff. Pointer is internally illuminated. Backlight is red for the best form of night time visability. Dial graphics light red when illuminated and anti scratch glass lens with fog resistant coating and polished stainless steel bezel. • Light pipe, directing light evenly behind the translucent dial as well as into the pointer staff, provides the best in night visibility. • Easy to read black graphics on a silver dial background. • Convex, domed glass lenses are scratch resistant. • Low profile bezels follow the curvature of the lens, with no ‘lip’ to trap and hold water. • Internally shielded to prevent magnetic interference. 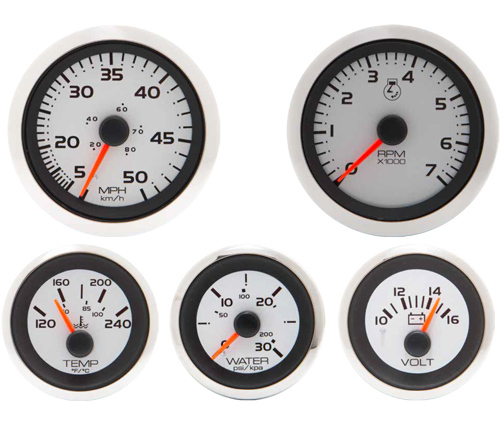 • 5” speedometer and tachometer available. • Complies with SAE J-1810.